SKF has signed a three-year contract worth around €3.5 million with Valeo to supply SKF Rotor Positioning Bearings for the new i-StARS, Valeos stop-start system. i-StARS automatically cuts off the vehicle’s engine when slowing down under 8 km/h, for instance, when stopping for a red light. The system enables further reduction in CO2 emissions and even less fuel consumption compared to the first generation StARS. 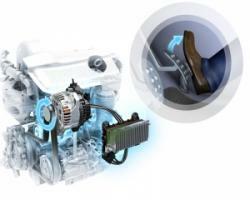 i-StARS will initially be used with both manual and automated manual transmissions to equip the new diesel engine family, e-HDi, for the Citroen and Peugeot brands. The SKF solution provides a powerful, accurate, repeatable and durable magnetic field making it possible for the control unit to receive data on the positioning of the shaft which enables the system to stop and re-start the engine smoothly at the correct time. This is the second business awarded to SKF by Valeo for this kind of application. SKF already supplies this solution to the first generation of StARS.